Wearables is a pretty big thing... I don't care what the naysayers say. Many of the folks I know who get one, get into it a lot. And there are choices out there for what you might want to nab. One that is pretty appealing that's come across the inbox is this one from Laipac, the LooK watch. I had to google it, but it turns out that they're in Toronto. So, my interest goes up, because I have some soft spot for Candian companies. Now Laipac isn't just some small company with a couple of entrepreneurs, rather there are some legs beneath them in terms of tracking technologies, so I feel a little more assured about the folks running this. However, a true wearable, is something new for them, which is why I would imagine them bankrolling it via a kickstarter is a good way for the company to determine true market viability. 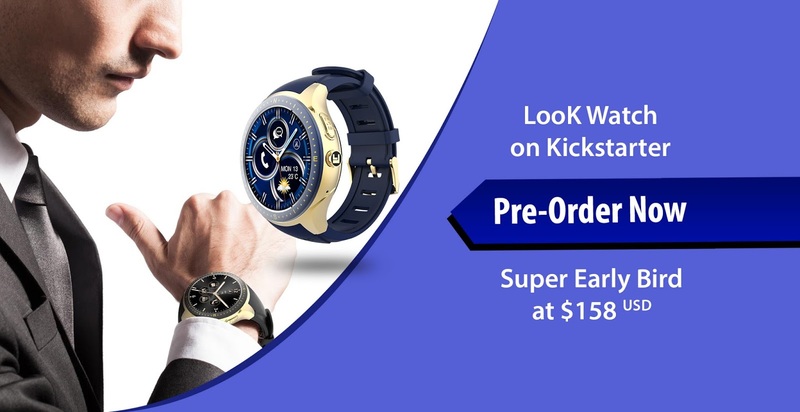 Now the watch has a 'super early bird' backing pledge price of $189 (note, it's in CDN too). The Kickstarter will run until the end of October, and if backed will ship potentially February 2018. After, it's assumed that the retail price would be around $315. Which is still a pretty good price when compared to some of the potentially equivalent styles like the Asus ZenWatch 2 (about $350CDN) or the Samsung Galaxy Gear S3 (about $450CDN). So, what do you get from this watch? Wow, lookit that storage. Which is nice as I've started to realize the limitations of 4GB when I'm storing music on my watch. 1GB RAM would be awesome as I'm finding that Android Wear 2.0 does have a little more strain at times. Now, I've not heard back from the folks at Laipac if the device is using Android Wear, because on the site itself it says it's Android 5.1 (which would put it way behind the times). Everything I've seen from the videos makes me think it's Android Wear 2.0. My concern would be if they're talking about it being 'standalone' (as they've mentioned a few times) that it wouldn't link up with our phones like I'd expect out of Wear. Curious. Now, it's curious that of all the features to really put front and centre on a watch is an SOS button. The idea being that you hit it and it'll send an SOS to your pre-programmed numbers. I can just see that going off by accident. They also have a fall detection feature so that if you fall and it detects it and you're non-responsive, it'll do the same. Again, hopefully there'll be no false messages sent out. Neatest of all would be that it has stereo speakers. Not just a speaker, but stereo speakers. That's pretty cool. My son and I love playing with Google Assistant and use my watch often to see the responses, but now we could get to hear it. So, are you interested in this option? A super early bird pricing option is pretty enticing... just not sure I could wait that long.